Monsanto Roundup weed killer may be a carcinogen that can cause cancer. Roundup contains glyphosate which may pose an increased risk for the development of certain cancers, including non-Hodgkin's lymphoma, hairy cell leukemia, and multiple myeloma. If you have cancer and have been exposed to glyphosate from contact with Roundup, you may be eligible to bring a lawsuit for money damages for the needless harm that has been done to you. Call Miller & Zois at 800-553-8082 or get a free, no-obligation online case review. Roundup is the most widely used herbicide in the world as a weed-killer. It is used on lawns, gardens, parks, playgrounds, and more. More than $6 billion in revenue is generated every year for its manufacturer, Monsanto. Over 250 million pounds is sprayed each year. Yet, in 2015, the World Health Organization (WHO) declared it a "probable human carcinogen" due to the ingredient glyphosate. The most serious side effect of the exposure to glyphosate is cancer - non-Hodgkin's Lymphoma (NHL), Leukemia, B-cell lymphoma, and multiple myeloma. Farm workers are said to be the most at-risk class for developing NHL, which is a cancer that can start anywhere in the body from white blood cells in the immune system. Symptoms include anemia, chest pain, enlarged lymph nodes, and shortness of breath. Garden center employees are most at risk for developing leukemia after exposure, and symptoms of leukemia include chills, bleeding or easy bruising, fatigue, fever, severe infections, and recurring nose bleedings. Those at high risk for developing B-cell lymphoma are nursery employees, and the symptoms can include chills, an enlarged spleen, night sweats, pain/swelling in the head, and fever. Certainly, anyone using this product is potentially at risk. 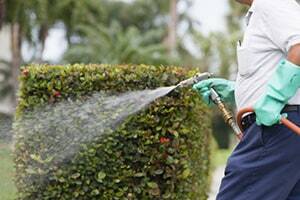 But landscapers, gardeners, and farmers are most likely to have the most significant exposure to these pesticides. In September 2003, researchers conducted a study of 3,400 farm workers in the Midwest. The Journal of Occupational and Environmental Medicine published an article, finding that higher rates of non-Hodgkin's lymphoma are associated with glyphosate exposure. A research article published in the International Journal of Environmental Research and Public Health focuses on systematic reviews and analysis of over 30 years of research on the relationship between NHL and occupational exposure to an agricultural pesticide. It found a "striking increase" in the incidence of non-Hodgkin lymphomas in the last 30 years. Further, the article finds that farmers tend to have low overall mortality rates but high rates of some cancers, which the agrochemical exposure may explain. Most importantly, it confirms that glyphosate exposure, in particular, is positively associated with a common sub-type of NHL, B-cell lymphoma. In 2015, a report from the International Agency for Research on Cancer (IARC), a division of the WHO, finds glyphosate to be "probably carcinogenic" and causing cancer in lab tests on animals and damage to DNA in human cells. Now keep in mind that source here. This is the WHO. It is not some plaintiffs' lawyers with a financial incentive to blame these pesticides for cancer. The WHO is one of the most respected health organizations in the world. In response to this, Monsanto has trotted out Dr. Donna Farmer to the media. Dr. Farmer has studied chemicals at Monsanto for over 20 years. She disagrees with these new findings of a cancer risk and says that the chemical is safe (or at least there is no data to support an association). She accuses WHO of cherry-picking the data and interpreting studies differently than researchers who actually did the study. Dr. Farmer says that glyphosate targets a particular enzyme in plants, which humans and animals don't have. Her long-term study shows that the chemical doesn't cause cancer. Jurors will eventually need to decide whether Dr. Farmer or whether they believe these scientists that are claiming these pesticides cause. The Environmental Protection Agency is currently in the process of evaluating glyphosate, as part of the standard procedure for chemicals every 15 years. There have also been regulation concerns about Roundup, including a bill introduced in Hawaii to ban it from public roads and parks. A bill passed in France banning it from home-gardening centers. There has also been a declaration by Denmark's Working Environmental Authority warning gardeners not to use it to control weeds. Time will tell but these actions appear to presage to a new movement to restrain the use of these pesticides for the public health. In April 2015, a class action lawsuit was filed in Los Angeles, accusing Monsanto of false advertising for its claim that Roundup is harmless to human health. An individual claim was filed in October 2015 in Delaware, for three plaintiffs, and more claims in New York and California. Also in April, a federal judge in California refused to dismiss a lawsuit filed by a man who blamed Roundup for his non-Hodgkin's lymphoma. His lawsuit alleges that he used Roundup to kill weeds and poison oak and that Monsanto failed to warn that glyphosate is a known human carcinogen. This lawsuit will open the door to more suits against Roundup if the history of mass tort litigation is any guide. In May 2016, three Nebraska farmers and an agronomist were diagnosed with cancer and sue Monsanto over Roundup. They claim that Monsanto misled consumers about the chemical's safety and that they developed cancer because of it. They further allege that Monsanto "concealed or systematically sought to discredit" the dangers of the product. One mystery in these cases has always been why the FDA was always soft-pedaling the risk associated with Roundup. In March 2017, we may have gotten an answer. We got a closer look at the relationship between the FDA and Monsanto when documents were released indicating Jess Rowland, a former deputy director of the EPA’s pesticide program, had offered to kill an FDA study of the association between Roundup and cancer. Rowland obvious wanted to please Roundup and claim credit for suppressing the study. “If I can kill this I should get a medal,” Rowland told a regulatory affairs manager at Monsanto. When this call came to light, Rowland quickly retired. What is he doing now? You guessed it. He is a consultant for chemical companies. To be fair, Monsanto consistently defends itself by claiming that the product is safe for people. They have fought against being required to put cancer warnings on their products since the 1980s. There is no question that there is more research to be done to solidify the HMO's opinion. But, the position that these pesticides are becoming harder and harder to defend. About a dozen lawsuits have been filed against Monsanto and its partners by farmworkers. If compensation is awarded to one victim, it is foreseeable that many more will file a claim. Since the 1970s, millions of agricultural workers have been exposed to Roundup, and further, non-Hodgkin's lymphoma is one of the most common cancers according to the American Cancer Society. Is There an MDL Roundup Class Action Lawsuit? In August 2016, Monsanto asked a federal judge to centralize 21 Roundup suits into a Multi-District Litigation (MDL) in Illinois. An MDL would be a huge step forward to finding out what Monsanto knew about these risks over the years because it would allow victims' attorneys to pull their resources to further investigate these cases. A class action MDL would also make it easier for victims to file lawsuits and participate in future settlements, often with minimal effort required on behalf of the claimants. In October 2016, the MDL Panel agreed the cases should be consolidated. All federal court cases in the Northern District of California under Judge Vince Chhabria. In October 2017, Judge Chhabria is expected to rule on many defense motions to dismiss these cases. Plaintiffs' attorneys expect to win these motions. If plaintiffs do prevail, the settlement value of the Roundup pesticide cases will dramatically increase. In May 2018, the California state court cases are moving along nicely. Plaintiff's experts have all been cleared by the court to testify. This is a big deal because the problem in mass tort cases like this is getting the scientific case to the jury because the judges will often exclude our experts before they even get to a courtroom. In August 2018, the settlement value of the Roundup cases surged when a California state court awarded a groundskeeper who suffered from non-Hodgkins lymphoma $289 million. This jaw-dropping verdict as reduced to $78 million by the trial judge in October 2018. But the verdict and the impact on the settlement value of future Roundup cases remains. Another case is set for trial in the MDL in California in February 2019. So this is a federal court case being tried in California as opposed to the $289 million verdict which was in state court. The stakes in the next case could not be higher. It is rare a company of Bayer's size has its stock price so tied into litigation. When the MDL ruled the first bellwether trial would be bificurated (two different trials, on for liability and one for damages) and some evidence of corporate misconduct inadmissible on January 3, 2019, Bayer's stock jumped almost 7%. The irony of it all is that Bayer bought Monsanto thinking that is was the company that could control the litigation risks that Monsanto faced. That bet is not looking very good right now. If you or a loved one has suffered serious side effects these pesticides, call us today at 800-553-8082 or get a free, no-obligation online case review.